Hakkasan is well known for its sleek Christian Liaigre-designed interior and its sky-high prices. The place has done well enough that there’s now a Mayfair location, as well as outposts around the world. And with Alan Yau no longer the man in charge, you can’t help wondering if the food and service are still any good. I have a slightly different image of Hakkasan, though, as a place that serves up very good Chinese food using quality ingredients at reasonable prices. Hakkasan’s menu is huge and diverse in price and style, and the cost of your meal can very enormously depending on what you order. Several times a year, Jon and I drop by for what can only be called a casual dinner. The only thing that keeps us from going more often is the effort it takes to dress up a bit (though jeans and a black T seem to go over just fine on a Sunday or work week night). Last Sunday night, for example, we were too lazy to cook and wanted to bring my visiting-from-the-US mom someplace good. And she has a weakness for Chinese food. So off we went to Hakkasan. Normally, we don’t bother with starters, but we broke our own rule last Sunday and got the dim sum platter, which was overly steamed. The rice flour wrappers on all four types of dim sum were gloopy and smooshy, and the reddish-colored one didn’t even taste good. I think it might have been a tomato wrapper filled with tomato gel. At least the scallop filling of the shu mai was good. We did much better ordering mains, as always. 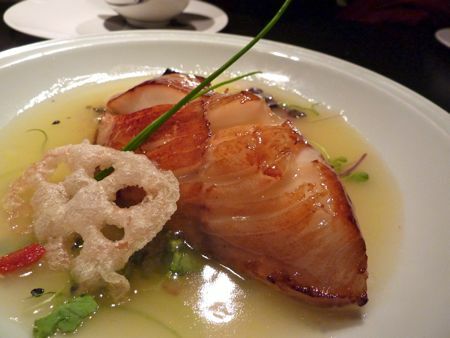 The one pricey dish I get sucked into at Hakkasan is the restaurant’s signature “silver cod in champagne sauce.” I know it’s the equivalent of ordering Nobu’s miso cod, but it really is pretty tasty. Silken shards of cod in a citrus-perfumed champagne sauce. I look forward to it every time. Silver cod aside, in general, I love the humble claypot dishes at Hakkasan. 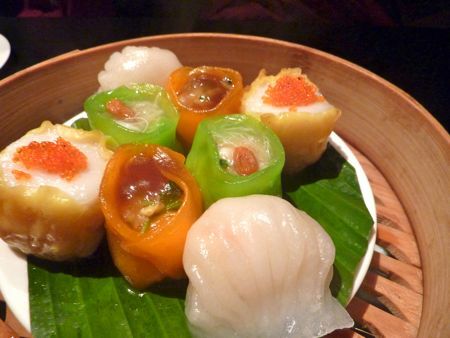 Maybe you’re paying a couple quid more than you would at a divey Chinatown place, but at Hakkasan, you get top-notch ingredients and a skilled, consistent hand at the stove. 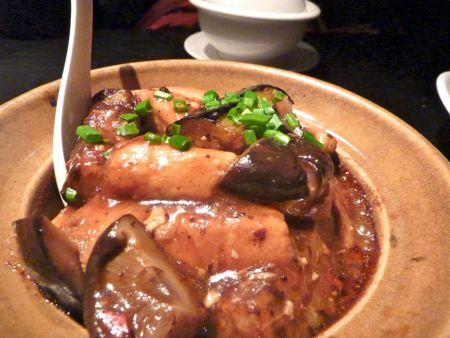 The tofu and aubergine claypot is a star, with both main ingredients cooked to silky-smooth perfection, and the umami-rich mushrooms boosting an already powerful flavor mix. Eaten with plain white rice, it’s the best. Twice-cooked pork belly is now available seemingly everywhere, thanks to the growing popularity of Szechuan cuisine, but Hakkasan’s is spiced and flavored just right every time. There’s just enough kick from the citrus-scented, tongue-numbing Szechuan pepper corns to cut the fattiness of the pork belly, and the medium-firm tofu and cabbage add great texture. This one is another favorite of mine with white rice. Hakkasan always seems to be out of the sauteed snow pea shoots (yet it’s always on the menu), and I always end up with sauteed morning glory as a substitute. Crunchy, slightly sweet, doing its wonderful vegetable thing. 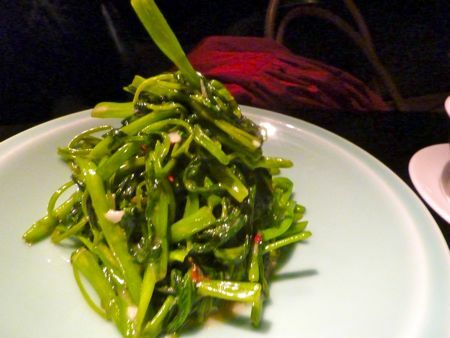 You can’t have a Chinese meal without greens, yes? With three bowls of rice at £2.50 a pop and just lots of tap water, our dinner for three people totaled a perfectly-reasonable £105 with service charge. If we’d avoided the £35 silver cod, I’d say £70 for three people would have qualified as a particularly reasonable cost for a filling and delish dinner. Point is, you can go to Hakkasan for more than the scene and pricey cocktails. You can go for the food! So try to ignore that raucous party of Russian oligarchs nearby and just enjoy the cooking. There are some real gems on the menu. Hakkasan, 8 Hanway Place, W1T 1HD; 0207 927 7000; closest Tube station: Tottenham Court Road. I don’t wish to do-down Alan Yau too much (there are precious few British-Chinese role models out there) but I do think you’re overplaying his influence over quality control. It’s the head chef who’s the most important person when it comes to the food, and according to Hakkasan’s website, the same guy’s been in charge since the restaurant’s inception. Moreover, Alan Yau is still in charge of Cha Cha Moon, and that’s pretty grim. Incidentally, Yau has just opened a place in Hong Kong serving western food. Reaction has been mixed, apparently. PS: Back to the food, that dim sum platter looks like a plastic model. Well, I didn’t intend for that one sentence about Alan Yau’s selling off Hakkasan to become the point of the blog post (which is more about how you can find some genuinely-tasty and affordable dishes on the Hakkasan menu), but I’d argue it’s unfair to NOT give Alan Yau credit for the overall quality of Hakkasan or Yauatcha — food, service *and* decor. Before either of those restaurants appeared on the scene, what represented Chinese cooking in London? And how about the owner’s role in choosing and supporting a talented head chef (like Tong Chee Hwee)? In any case, I’m not going to claim that everything Alan Yau does is fantastic (as you say, Cha Cha Moon is grim), but if there’s a winning formula in place and you change something big (like ownership/management), it’s reasonable to wonder if things will go downhill. 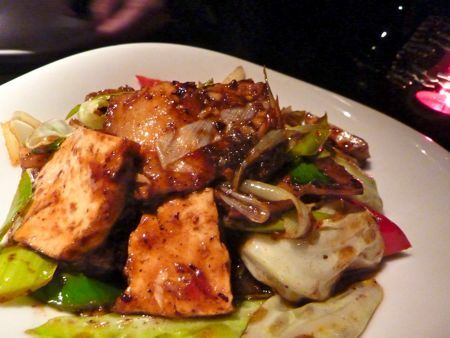 I haven’t been to Hakkasan for ages, so I was pleased to read your blog on it. I love clay pot dishes, so may go back just for those. I think the small serving of tong choi (morning glory) for £10 sums up the rest of things. Oh, and isn’t there a golden rule amongst chinese food aficionados? – never order dim sum outside of ‘yum cha hours’. Well that’s what my Chinese friends tell me anyway. There goes Ping Pong’s business model, but they are aimed at Westerners. Cha Cha Moon used to be good. Not many things last it seems. I have recently returned from Sydney (where I’m from) and went mad there on Chinese food. It’s still one of my biggest lamentations for living in London – the Chinese (read: mostly Cantonese) food over here just pales into comparison with Sydney (and Hong Kong of course). I am not going to pay Hakkasan prices very often. So true! Dim sum lunch at Hakkasan can be quite reasonably priced – I am a sucker for their cocktails though. I’ve only been to Hakkasan with work so not on my own money, but I’ve always been astounded by the prices on the menu; although you do get a few cheaper dishes, there are many in the £30 bracket and always the more interesting-sounding ones. The Japanese tofu claypot wth blue crab was delicious though. I made the splash over the pond last year, moving from my beloved New York City to London. I have always had a special place for London in my heart and when the opportunity came to work in London I could not turn it down.